New photos from overseas show a purported iPhone prototype with a larger touchscreen display, similar to the rumored edge-to-edge iPhone 5 screen. 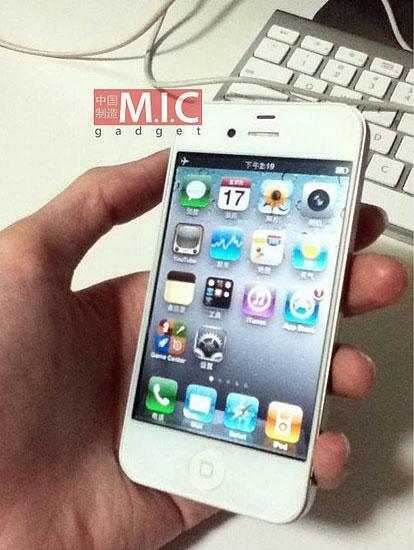 The photos were shared Monday by MIC Gadget, which made no claims about their authenticity. 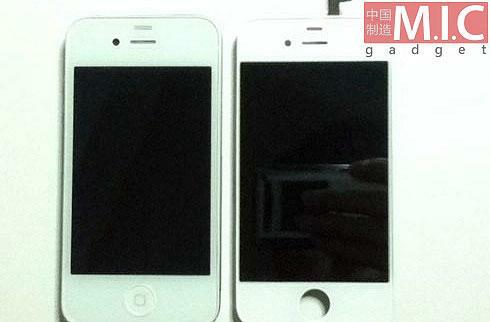 The photo from China shows a white iPhone with a body similar to the iPhone 4, but a larger screen on the front squeezed into the same frame. The front of the device also shows the new proximity sensor spotted on the white iPhone 4, set to finally go on sale this week following numerous delays. While one photo shows what appears to be an operational unit, a second picture features what is just a front panel and LCD component, without the rest of the phone. It too features the newly designed proximity sensor above the earpiece. The pictures are supported by similar alleged engineering sketches that were first revealed in March. Those "mold engineering drawings" claimed to be for Apple's fifth-generation iPhone also featured a slightly larger edge-to-edge display. The current iPhone 4 sports a 3.5-inch display with a resolution of 960 by 640 pixels. Reports have suggested that Apple is looking to expand the screen size to either 3.7 inches or 4 inches with a next-generation model. The anticipated fifth-generation iPhone is rumored to arrive later than usual this year, after the typical June launch timeframe. Reports have suggested that Apple will begin production of the device in September, but that the new device's design will feature only "slight modifications" from the current iPhone 4.